Take a step back in time...to the days when "Trenton Makes The World Takes" was more than just a slogan on the side of a bridge...when New Jersey's capital city had a first-class hotel called the Stacy-Trent. 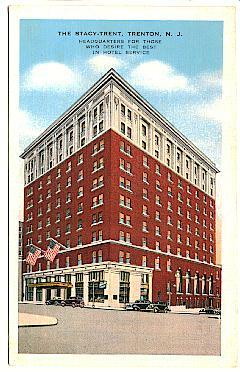 The Stacy-Trent, an elegant 250-room hotel located in downtown Trenton at the corner of State and Willow Streets, opened its doors on September 19, 1921. It was named in the memory of the two founders of Trenton: Mahlon Stacy and William Trent. The Stacy-Trent was host to countless celebrities, important government officials and visitors to the city of Trenton and her surroundings. The hotel also served as a meeting place for a multitude of social functions. The Stacy-Trent declined during the 1950s and 1960s. Ownership and management changes were made, but the hotel could not be saved. The Stacy-Trent was demolished in 1967. I appreciate you taking the time to stop by this site . . . hope you enjoyed it!